San Pier Maggiore was one of Florence’s most important churches until it was demolished in the 18th century. What can digital reconstruction tell us about the original structure and the artworks it once contained? In his 1938 classic, The World of the Florentine Renaissance Artist, Martin Wackernagel put his finger on the biggest hurdle to understanding the city’s religious art: ‘Almost all the important altarpieces from Florentine churches have survived solely in museums. And this fact has so deeply affected our habitual outlook and consciousness that we almost have to force ourselves to remember how little this fundamentally corresponds to the original destination of the work, which also in many ways affected its form.’ Wackernagel’s prescient words anticipate one of today’s trickiest curatorial challenges: how to communicate historical context – and the rich webs of meaning that attach to it – within the aesthetic realm of the art museum. This tension is especially marked in the display of Italian altarpieces, whose status as masterpieces of Renaissance painting is tempered by their latent liturgical and devotional functions. When the Archbishop of Westminster suggested in 2008 that London’s National Gallery should restore Piero della Francesca’s Baptism of Christ to a Catholic church, he was not entirely joking. Three years later, the National Gallery responded with ‘Devotion by Design: Italian Altarpieces before 1500’, an exhibition dedicated to the functional design and ritual context of its Italian altarpieces. The show gestured towards historic settings via fictive altar tables and simulated candles and arguably pushed this strategy of contextual display within the gallery space to its practical limits. An obvious alternative path for addressing the interpretative deficit between the museum space and our increasing awareness of historical context is digital visualisation and augmented reality. The V&A’s Medieval and Renaissance Galleries, which opened in 2009, incorporate a digital reconstruction of the Florentine Renaissance church of Santa Chiara, sections of which were dismantled, shipped, and rebuilt on the Museum’s South Kensington site in the 1860s. A virtual model of Santa Chiara communicates the discontinuities between the architectural fragments on display in London and the original church in Florence, insofar as art-historical research permits its reconstruction. This autumn the National Gallery stages another exhibition focused on an altarpiece from its permanent collection: ‘Visions of Paradise: Botticini’s Palmieri Altarpiece’. Francesco Botticini’s enormous The Assumption of the Virgin altarpiece (c. 1475–76) used to overlook the great staircase leading up to the National’s Sainsbury Wing galleries until it was removed for study four years ago. The exhibition will be a chance to see Botticini’s painting up close and to discover more about its patron: the apothecary, poet, and politician Matteo Palmieri, one of Renaissance Florence’s most colourful and controversial figures. The altarpiece was installed in 1477 over the altar of Palmieri’s private chapel within his local church of San Pier Maggiore. This building was demolished at the end of the 18th century and its loss is especially unfortunate for our understanding of Botticini’s painting. The format, scale, and iconography of the Assumption are all unusual for a Florentine altarpiece of that date. It is tempting to follow Wackernagel’s logic and attribute the unexpected aspects of the painting’s design to the particularities of its physical setting – its ‘original destination’ – within the church. The National Gallery houses another important altarpiece from San Pier Maggiore: Jacopo’s multi-tiered polyptych that was placed over the church’s high altar around 1371, just over a century before Botticini painted The Assumption of the Virgin. The main register of the polyptych depicts a host of saints gathered to either side of the central Coronation of the Virgin. St Peter occupies pride of place in the front row, first to the proper right of Christ and the Virgin. As well as his traditional attribute of the keys to Heaven and Hell, the apostle holds a model of the church dedicated to his name. These two altarpieces – so different in style and design – were displayed together in San Pier Maggiore for over three centuries. Hitherto shown in different rooms in the National Gallery, they are reunited in the ‘Visions of Paradise’ exhibition. Are these altarpieces destined to remain disconnected from the context for which they were created? What can be learnt about a church that no longer exists? The ‘Visions of Paradise’ exhibition provided the pretext for a collaborative initiative between researchers from the National Gallery and the University of Cambridge to reassess the evidence and attempt the first digital reconstruction of San Pier Maggiore. Mindful that our data was likely to be fragmentary, we were also concerned to engage with broader challenges in the 3D visualisation of historical environments. The most notable of these is the difficulty of embedding uncertainty or hypothesis within the kind of high definition, rendered simulacrum that currently dominates the field. Transparency has been identified as the ‘burning issue in 3D visualisation applications to cultural heritage [ … ] crucial if such applications are to mature as a research method and acquire widespread acceptance’. Located around 500 metres to the east of Brunelleschi’s cathedral dome, San Pier Maggiore was one of Florence’s oldest and most prestigious ecclesiastical institutions. Claiming origins back to the 4th century, it was re-founded c. 1000 as a Benedictine convent. The nuns of San Pier Maggiore were drawn exclusively from elite families and the abbess enjoyed the notable privilege of symbolically marrying every new Archbishop of Florence on his arrival in the city. The bishop gave the abbess a golden ring and in exchange the nuns presented him with a bed to take home. San Pier Maggiore was comprehensively rebuilt in the early 14th century and this gothic core was later extended through the construction of private chapels around its perimeter. Historic plans and views provide some evidence for the church’s configuration in its Early Modern heyday, when the interior housed one of the city’s most significant ensembles of religious art. The nuns’ luck ran out in 1783. A column collapsed during renovation work and the Florentine authorities seized the chance to turn a quick profit, declaring San Pier Maggiore structurally unsound, suppressing the convent, and repurposing the city-centre site as a marketplace. Its artworks were returned to their lay patrons, assigned to other religious institutions, or dispersed through the art market, gradually filtering into public and private collections. The artistic diaspora from San Pier Maggiore now stretches from Sarasota to St Petersburg and, in addition to the National Gallery’s altarpieces, several major paintings are preserved in the UK. Tommaso Mazzuoli’s large Visitation (1560), from the Pesci family chapel, made its way to Cambridge via Rome and London and since 1955 it has served once more as an altarpiece in the college chapel of Trinity Hall. A fine Adoration of the Magi, painted by Ludovico Cigoli in 1605 for one of the Albizi chapels, now hangs over the fireplace at Stourhead House, Wiltshire. Once the nuns were ejected and the paintings removed, the gothic church was promptly torn down. Only the elegant portico that had been added to the façade in 1638 was spared. Those arches, now filled with shops and apartments, still form a pleasing backdrop to today’s Piazza San Pier Maggiore, but otherwise the ancient church of that name seems to have vanished entirely from the face of contemporary Florence. Despite San Pier Maggiore’s apparent destruction, fieldwork in Florence offered the best hope of generating new data for the reconstruction, and the project team made two research trips in May and July 2015. At the outset, we had no idea what we would find. Historical descriptions and surviving archival sources are relatively plentiful and provided a baseline of information, but the site itself was an unknown quantity. Initial impressions on arrival were not encouraging: the area has undergone repeated transformations and is now occupied by 19th-century apartment blocks with a variety of shops and businesses at street level. The former nave of the church is itself now a street – the Via San Pier Maggiore appropriately enough – open to the sky. Our objective seemed to be wholly subsumed within a bustling neighbourhood of central Florence. Quickly, however, it became clear that the contemporary city would be our most important ally, as the community who live and work in this neighbourhood became active participants in our efforts to recover the lost church. Scholars working in Florence generally base themselves within the city’s wealth of libraries, archives, and museums. For us, the local cafe became the hub of operations, providing not only shelter from the summer heat, but a network of contacts as residents put us in touch with friends or neighbours with stories to tell or stonework to show. And steadily the church began to emerge: a Renaissance chapel pilaster located in a toilet; an early 14th-century arch in a kitchen; a transept pier in a crowded storeroom; and, most extraordinarily of all, the church’s medieval campanile and spiral staircase in an attic, its truncated stump converted into a terrace with panoramic views over the rooftops of Florence. 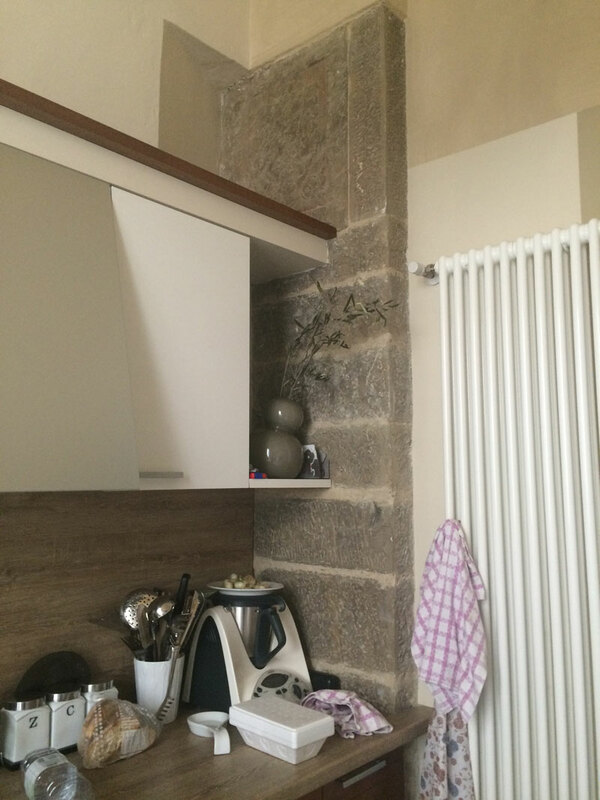 Private owners had followed the present fashion for exposing passages of historic stonework when renovating their properties, but these fragments had never been collated. 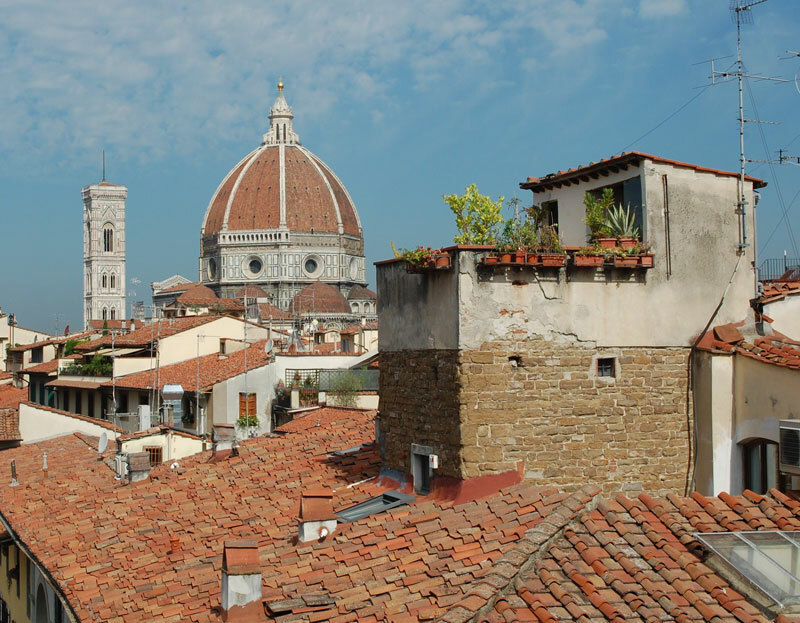 Indeed, in most cases, members of the local community were unaware that they lived and worked within the former spaces of one of Florence’s most important churches. Every discovery confirmed the suspicion that San Pier Maggiore’s demolition in the 1780s had been a pragmatic affair, with significant sections of the church’s superstructure left standing to buttress the new buildings that rose in its place. Careful examination of surrounding façades identified several piers from the church’s crossing and transept, some of them still with their lion-headed drainage spouts intact. Recovering the vestiges of San Pier Maggiore came to resemble an archaeological excavation, with the added advantage that the finds retained their original spatial relationships; this established coordinates not only for the church’s plan, but also its elevation. By combining the physical traces of the church with written sources and the careful measurement of the site, we could now perceive the architecture of San Pier Maggiore embedded within the present urban fabric. Jarring juxtapositions emerged: the Palmieri chapel, home to Botticini’s mighty Assumption, is now the backroom of an art-supply shop; Jacopo di Cione’s golden polyptych stood in what is today the middle of a street. But how are these findings best represented? While much has been discovered, much more remains hidden or lost. At an early stage we decided not to pursue a traditional 3D visualisation using wire-frame models built up from floor plans and cross sections. Such visualisations oblige their authors to make myriad subjective choices when finalising form, colour, and texture: decisions and doubts which are then absorbed and masked within seamless and all-too persuasive visions of the past. Furthermore, initial attempts to model surviving fragments of San Pier Maggiore’s superstructure using conventional architectural CAD software exposed how the tendency of such techniques towards rectilinear volumes would inevitably resist the physical subtleties and inconsistencies of the built environment we were grappling with. Instead we chose to model the current buildings using photogrammetric software: computer programmes with automated features that match and stitch together thousands of still images to create 3D meshes cloaked in the textures and colours extracted from the photographs. The digital visualisations generated by photogrammetric techniques are more accurate and can claim a greater degree of objectivity. The resulting facsimiles of present-day reality can then be interwoven with virtual architectures to create models which combine existing environments with hypothetical reconstructions of past structures. For example, using a 3D photomodel as a starting point allows us to highlight the remains of San Pier Maggiore within their current settings. Each fragment can then be isolated and manipulated before being re-established, alongside other fragments, within a virtual model of the whole church. Given that so many aspects of San Pier Maggiore’s appearance remain uncertain – even down to simple features like paving materials or the finish of the walls – the virtual elements of the reconstruction are realised as a point-cloud model. This conveys a sense of forms and volumes without requiring the precise definition of profiles and planes. Suggestive yet fuzzy, the point cloud is intended as a more honest and transparent representation of our incomplete and uncertain understanding of San Pier Maggiore’s historic fabric. By reconstructing one of Florence’s most important churches, we have a better sense of the original functions that the National Gallery’s altarpieces were meant to serve and the sacred architecture they were designed to adorn. The soaring pinnacles of Jacopo di Cione’s polyptych can now be read in relation to the church’s gothic architecture. The choice of landscape format for Botticini’s Assumption makes more sense if the altarpiece was displayed within a chapel which had a significantly lower roof line than the vaults of the main church. Although the architecture of the Palmieri chapel was relatively modest, it was in a prominent location beside a doorway linking the church interior with the city street behind. Visitors entering and exiting the church via this door would have passed directly in front of Botticini’s Assumption and the painting’s visibility may help to explain its surprising combination of impressive scale and exacting detail. The culmination of the project is a film, made by Miguel Santa Clara, which plays in the film theatre next to the Sunley Room for the duration of the ‘Visions of Paradise’ exhibition and is viewable online. In addition to presenting the digital visualisation of San Pier Maggiore, the film describes the experiences that lie behind the finished product and the choices that determined its final form. This more transparent mode of presentation aims to nudge the gallery public towards a richer engagement with the virtual past and its attendant interpretation; to explain how such visualisations are generated and the uncertainties they invariably mask. ‘Visions of Paradise: Botticini’s Palmieri Altarpiece’ is at the National Gallery, London from 4 November–14 February 2016.